Having an up-to-date television is one thing, but probably the greater hardship for my family in our U.S. rental has been sharing a single bathroom with one toilet. Our sweet little rental home was built in 1936 and for the time in which it was built, that indoor toilet was probably quite the luxury. In some parts of the world, indoor toilets still are a luxury and the focus of philanthropic work (see Gates Foundation work on this: "What we do: Water Sanitation Hygiene strategy overview"). Today though indoor plumbing is ubiquitous in the West; the OECD indicates that 97.8% of OECD countries have at at least one indoor toilet (see OECD better life index.). We've gotten to the point where a single toilet has become the minimal standard in private homes. Most everyone we know in Seattle has at least two bathrooms with a toilet each, and during our sojourn in France, we lived in two different apartments with two toilets in one and four(!) in the other, arranged variously as full bathrooms or water closets (or wc's), with just toilets and sinks. Occasionally, in France, we'd come across a bidet (not to be confused with a toilet), but these luxurious items seem to be much less common today. Luxury in toiletry does seem to be reserved primarily for the private home. Public toilets continue to be much more minimal, even in the West, although here there are variations. In France, we attended quite a few all-day soccer tournaments with hundreds of attendees at public stadiums where that minimal standard of a single, barely clean toilet was considered sufficient to meet the needs of all the players and their families. The conditions often required the provision of one's own toilet paper and the same kind of dexterity as the standing Turkish-style toilets at the French aires de repos (rest stops). Talk about antiquated models! These toilets off the toll highways were really old school (or barbaric, according to one expat friend.) 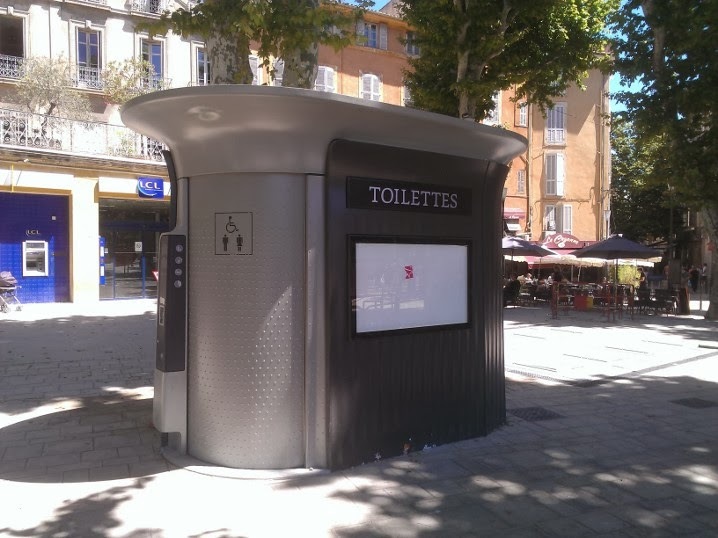 In our beloved and bourgeois Aix-en-Provence, public money was finally coughed up in our last year there for the installation of several fancy public toilettes (these are always referred to in the plural in French, even when there is only one!). I had to laugh at the installation of one which was right next to the location of a very popular children's bungee-jumping attraction, making it difficult for tourists to stand in line or to enter the 'facilities' without being jostled. French tourist offices don't typically offer access to toilets (not in Aix, not in Nice, not in Lyon), but the staff do direct people to private toilet facilities where you can pee for a fee, but these facilities were often a bit scruffy too. It seems that the French do not put a lot of money or effort into the provision of public facilities, while providing ample access seems to be much more important in the U.S., even if the toilets aren't always flushing models. 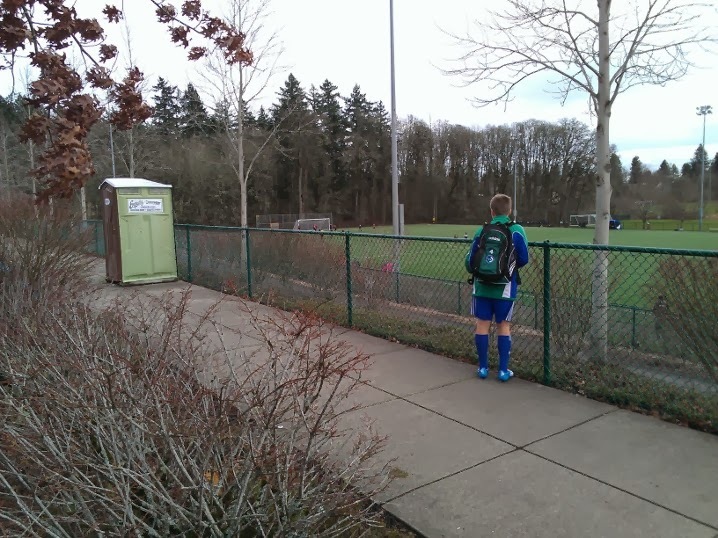 I'm thinking of the outhouse style port-a-potties such as the one I noticed two weekends ago, prominently stationed adjacent to a soccer field at my son's tournament in Beaverton, Oregon. Permanent facilities were also available at the sports complex, but since one particular field was a bit farther away, someone had thoughtfully installed a temporary toilet. I've even been to tournaments where a dozen such port-a-potties were set up, all in a row. When you gotta go, that's nice to know.